Down Syndrome Diagnosis Support That Rocks! Down Syndrome Diagnosis Network hasn't added a story. Down syndrome. The Down Syndrome Diagnosis Network exists to support these “Rockin’ Families” through that diagnosis experience and into early childhood. Our Rockin’ Family Fund makes that support possible. We’ve reached 1,500+ families so far and welcome more than 500 new families a year. Help us spread the love! Your financial donation lets us embrace our moms and dads with the care and resources they need, when they need it most. When a parent wants to learn or recharge: a scholarship to attend Ds-related conferences, classes, or events. Read more about what this means for families here. The Down Syndrome Diagnosis Network is a registered 501(c)(3) charity. Your donation for our Rockin’ Family Fund is 100% tax deductible. 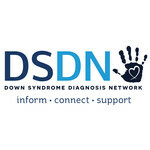 Down Syndrome Diagnosis Network hasn't posted any updates yet. Down Syndrome Diagnosis Network is managing the funds for this campaign. Down Syndrome Diagnosis Network is a verified organization.